The Oyster Meal (detail; c. 1664–65), Jacob Ochervelt. 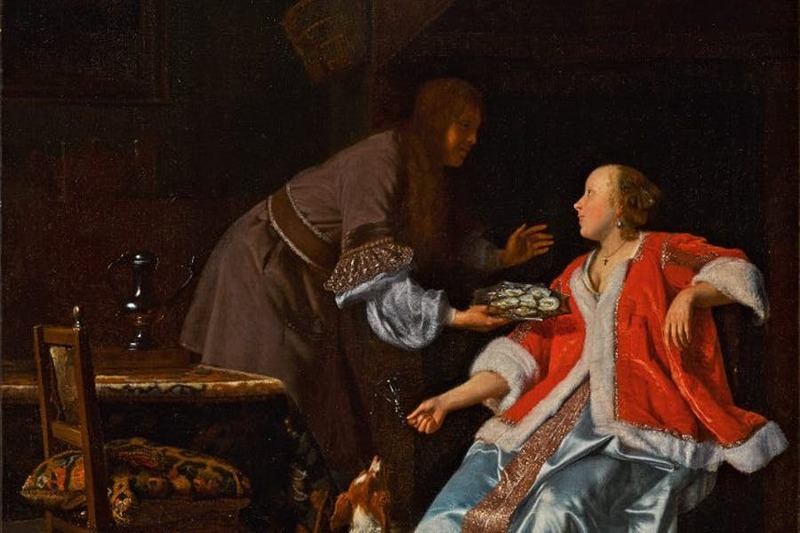 This July, a Dutch Golden Age canvas illegitimately taken by the Nazis is to be auctioned at Sotheby’s, London, after only recently being returned to the heirs of the original owner. It’s another reminder of the scale of Nazi persecution across Europe, but also of the commitment of such bodies as the Commission for Looted Art in Europe (CLAE) to return all works of art to their rightful owners. Entitled The Oyster Meal and painted by Jacob Ochtervelt in around 1664–65, the relatively small, slightly dirty but exquisitely painted canvas draws on a popular Dutch genre subject – and one open to a number of interpretations. Few then or now, however, would fail to see the man’s proffering of a plate of oysters – famed as aphrodisiacs since antiquity – as anything other than an amorous overture. 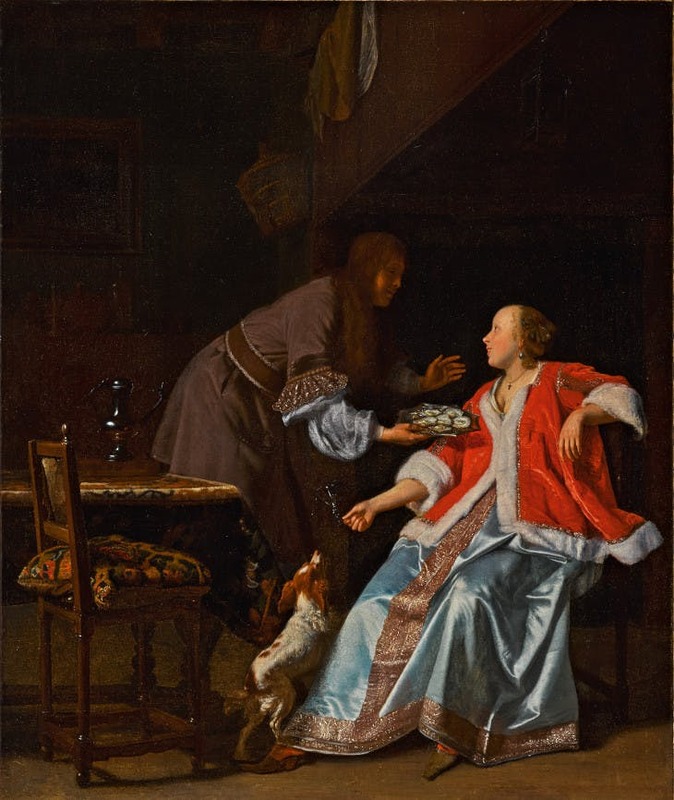 The fact that the woman tips droplets of wine from her glass to an eager spaniel – possibly to sedate it – as she gazes into her admirer’s eyes suggests that she is complicit. While many have described the young woman as a courtesan, not least given the bed in the room with its rumpled bedclothes and the empty birdcage above it, it seems unlikely that a young woman finely dressed in gleaming silks and down-trimmed velvet would live in such a shabby place. It’s clear that a knob is missing from the top of the chair in the foreground and that its back has come unstitched. Is this the home of her down-on-his-luck lover? A liaison at an inn? Either way, the painting is as much about the artist’s bravura technique in capturing the effects of light falling on to pewter, glass, fur and textile as it is about its risqué subject. It seems an odd painting to have in a paediatrician’s waiting room, but there it was hung by the Protestant J.H. Smidt van Gelder, the director and chief doctor of the children’s hospital in Arnhem in the Netherlands. He had bought it in 1936, part of a collection he had begun while still a student and which, by the outbreak of the Second World War, comprised some 25 mostly Dutch Old Master paintings. Increasingly concerned about Nazi looting after Germany invaded Holland in 1940, he had placed 14 of his most prized works into a bank vault for safekeeping. Having already joined the medical resistance against the Nazis, he was forced into hiding in 1943. Attending to the child of a German Ortskommandant (town commander), he had seen a map of Europe indicating the Eastern Front in the house and told the commandant’s wife that the front line was not as favourable to the Germans as the map suggested, thus revealing that he had been listening to banned broadcasts from the BBC. He left home before the Gestapo could arrest him – other members of the medical resistance were not so lucky – but his house was confiscated nonetheless. After the German army ordered the evacuation of Arnhem in 1944, the city was plundered – including the bank vaults. In 1949, five of Smidt van Gelder’s lost paintings were found in Germany. One, a portrait of the actress Mrs Jordan by Thomas Lawrence, was spotted by one of the doctor’s former patients in the bierkeller of a Düsseldorf hotel. Despite Smidt van Gelder providing very detailed lists of his stolen works to the Dutch restitution authority, the whereabouts of the Ochtervelt and five other paintings remained a mystery. That is, until a great-grandson, living in the US, searched online and found a painting that fitted the description of The Oyster Meal in London’s Mansion House, bequeathed to the Corporation of London in 1987 by Harold Samuel. The family then approached the CLAE, who uncovered the history of the painting since 1945 and negotiated its recovery. It was returned to Smidt van Gelder’s daughter, Charlotte Bischoff van Heemskerck, in November 2017. Piecing together the complex provenance of the painting, the commission unearthed a fascinating letter from the SS commander Heinrich Himmler to Martin Bormann, head of the party chancellery. Just weeks before the surrender of the Nazis, he had ordered an investigation into the ‘shameless’ looting at Arnhem, believing that the robbery would bring the Nazi party into disrepute – he appears to have been oblivious to the fact that its other actions had already achieved that. His report revealed that a Hitler Youth leader, one Helmut Temmler, had organised the bank robbery in 1945 and the spoils had been taken to Düsseldorf – hence Mrs Jordan in the bierkeller.